Architecture is easy, The real challenges are people. Books from last quarter – part one. I read or listen at least one book per two weeks. I want to share the list with you. First of all it is always worth to recommend good book. Second I hope you could help me. Please write your suggestion into comments. Thanks and happy reading. Crossing the charm by Geoffrey A. Moore. 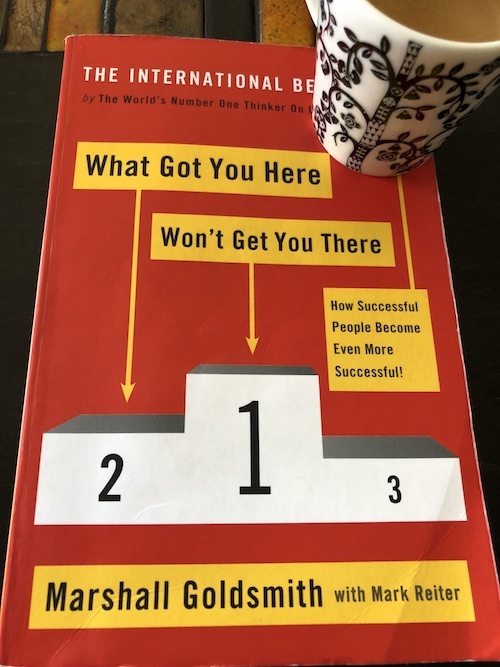 What Got You Here – Won’t Get You There by M. Goldsmith and M. Reiter. 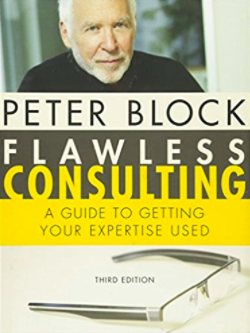 Flawless Consulting: A Guide to Getting Your Expertise Used (audiobook) by Peter Block. 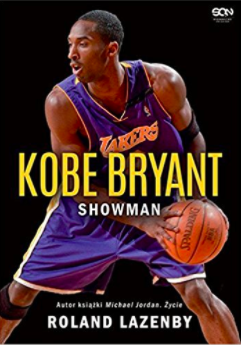 Koby Bryant – showman by R. Lazenby. 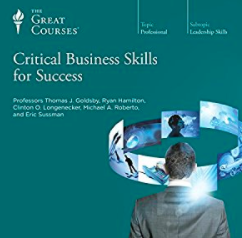 Critical Business Skills for Success(audiobook) by The Great Courses. The must read for everyone involved in high tech industry. 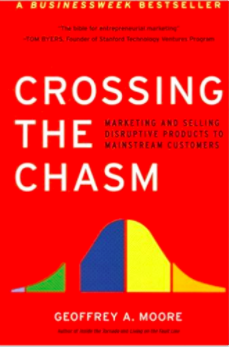 From the book you will learn about five stages of technology adoption, and how you need to have different attitude for marketing and selling. “Early adopters” want a change agent. “Early majority” looks for productivity improvement for existing operations (you need to be better somehow). Elevator Speech Template – “For …. (target customers) , who are dissatisfied with ……..(the current market alternative). Our product is a ………….. (new product category) unlike ………………(the product alternative). We have assembled …………..(key whole product features). Some time ago I had a training it was great and helped me get better. The most used phrase during this training was the title of Goldsmith book – “what got you here, won’t get you there”. This book is must have! I will just put one key takeaway here, because you have to read this book to get “Twenty Habits That Hold You Back”. Key Takeaways: The only person who stops YOU from the being on the top is YOU. This book is must read for consultants. Want to know how to deal effectively with clients? Read the book. Author by using illustrative examples and case studies help us understand all aspects of consultant job. The book is also for non consultant, as each of us is a consultant at some point in our lives. Finally “Flawless Consulting” is less about how to consult and more about how to communicate. You have to manage the relationship – it is essential to good implementation. You need to learn them to be able to solve their own problems after you’re gone. Creator of the bestseller Michael Jordan. He wrote another great biography of Kobe, who broke into the best basketball league at the age of only 17. Kobe was not only proud of himself eg. when he was asked about Jordan he answered “I’m going to be better than him”, but also extremely hardworking. He always was first at gym, and finished as last one. His live wasn’t easy but through hard work he was one of the best NBA player. Hard work is very important to your success. Shows how our decisions creates our opportunities. Being on the top isn’t dream, you must work even harder. Every part is led by business professors from top business schools. In each part you will learn about everything from key terms through methodologies and case studies. Key Takeaways: It is 60 lessons so it very hard to get key takeaways gere. This course brings MBA experience for you. 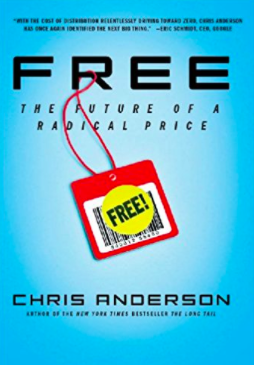 The book is about pricing models which give products and services to customers for free (referred to as “freemium”). The strategy works to attract users and then up-sell them at premium level. Chris Anderson explores this idea as business strategy for today’s companies. Sooner or later every company need to figure out how to compete with “Free”. If the price is zero, we all are irrational (it is proved in other books) and take decision much easier. “Generation Free”: Growing up post-Napster, younger generations find copyright irrelevant. This is very important book to me, as I’m in conversational interfaces business right now. 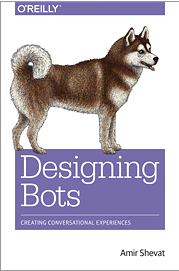 Ideal for designers, product managers and entrepreneurs – you will find out what works and what doesn’t on real-world bot examples. Author is co creator of Slack messanger so he guide us through different bot platforms based on his experience. If you are interested in conversional interfaces use for your business, than this book is must read. Personality is important, but more important is to keep it consistent across the experience. First things first: Define your bot’s purpose and core functionality. Mainly there are two types of conversations, task-led and topic-led. When possible do not fall into bot-amnesia. Grail Quest to find where went our productivity to (part three) ? In Part one we talked about problems with productivity, when adding more resources, introducing better processes like scurm don’t help. In Part two we focus on Work In Progress, when paradoxically the more we want to do, the less actually work is done. In order to fix Work in Progress of the team, we often what to help them. Let us split the team, so people are more focused on their work. Another fix is adding more people to the team (increasing the amount of work done). Unfortunately, the truth turns out to be brutal and it is quite different. You may find that for some reason the work goes even slower: more people/focus but smaller WIP. To be able to synchronize, you need to communicate. Quite often we do not realize how much time is wasted to communicate to each other. If you want to check the easiest way to do this is to measure the number of meetings. If you have a central system for booking rooms, just prepare and look at a simple report: the number of meetings per employee. At one point I even investigated this matter and came to the conclusion that the more people in the meeting, the more expensive it should be to book such a room. The idea of course has not been realized, but if you want to provide such service, than I will be happy to try out such reservation system. Everyone complains about the meeting, and then it turns out that anything in the company can not “moved forward” without meeting. Personally, I love my calendar today, because I do not have more than five hours in meetings per week. And even this is too much in my opinion. Sometime ago I had conversation during a conference with one guy. He told me that, they had a “customer service center” in which they have KPI: “how many calls per minute” and it was something about 10 calls per minute. Well, as usually happens, someone “upstairs” stated that he has an offer from a company that can do it much more effectively. So their call center was canceled and all work was outsourced to the outsider. The first reports allowed “the board” to celebrate success. The new company supports about 100 calls per minute – 10 times better efficiency. Great decision! You probably already feel trick here … because I wouldn’t tell a story here if it would not show another problem affecting our productivity. It turned out that customers called a dozen times for one problem. The operator wanted to handle (according to his KPI) them as soon as possible, very often by riding the client of. Client had to call several times to solve his problem, as a result the client were much less satisfied with the service. Not always the number of customers served goes in hand with quality of service. The first quick lesson – what you measure is what you get. Measure more calls per minute, you get more calls per minute, It does not mean better service and in many cases things goes worser. The second lesson is more important. It is worth looking for the problem at the source. Go to the source and start solving the real problem. Many times we use “tricks” to cover it – We can call it Failure Demand. An example from IT sector is a team that increases its velocity (sounds good) but does not provide any value. WTF? It can easily happen when there are more and more bugs which even increase velocity (every bug get a certain amount of story points). This leads to the situation when the team only do bug fixing (by the way bugs was introduced by the team), so no additional value is delivered. Quite often a remedy is to try to move part of work (eg. bug fixing) to different team, so development team can focus on delivering business value. We can introduce a team (QA) that will fix some of the errors, or will test whether the errors have been fixed, and so on. Sounds familiar? In this way, specialized teams are born. Now the “poor” developer can produce even more code. The testers are testing instead of him, the release managers do deployment instead of him, the incident managers react to production problems instead of him …. and so on….. This leads quickly to a situation in which the developer does not feel responsible and does not understand how his bad code affects the whole organization and work of others. The developer become detached, which become huge problem for organization. Looking at the work of teams that improve some “developers pain area”. When we move work to different team, than it causes developers to increase their bandwidth. More developers bandwidth increases Work in Progress (WIP) in pain-killer-team. This causes these teams to become a bottleneck. The whole organization focus on them, because they do not cope with the amount of work – so they (eg. testers) are the problem not developers. Interestingly – it hides the real people responsible for delivering the poor solution. Introducing such teams sooner or later creates siloses, which is very bad for organization. Furthermore we aren’t solving the right problems, and we are creating even more bottlenecks and more detachment in the organization. You can also look at that as local optimization destabilizes the workflow on a global scale. Workload up to 100% and the need for faster work has the opposite effect. The “worker” must have a moment to think and “sharpen the saw”. The more rules, the greater the focus on those rules. This causes us to blindly follow the rules and stop thinking, because rules do it for us (or at least we are safe). These are huge opportunity lost. The more work, the greater loss on context switching. This leads to the fact that everything takes longer. The cost of delays is increasing and many projects will never see the production environment. Hiding the problem (temporary solution) usually causes the problem to return with increased strength, and the cost of removing multiply (sometimes in exponential manner). You need to have time for unplanned work. This brings you to (#5) no time for unplanned work. The whole tightens the loop on your neck. R.I.P. Always have some loose time. Control the WIP and respond when it’s too much. Reduce the amount of work is better than slow down or even blocking the entire system. Remember: I love Lucy candy video. Solve problems at the source. Remember that always something happens, you have to have time to react. By the way, as Tech Rebels we help companies go through technical hurdles. Just hire us, and we will bring your organization to next technical level. During the Polish Long Weekend (actually very long), I had some speare time. I had great time with family, so after my little devils felt asleep. I though: “Let me see what I have in my draft post list” (which it is huge btw). One of interesting entry from January is “Hardening Wrodpress”. 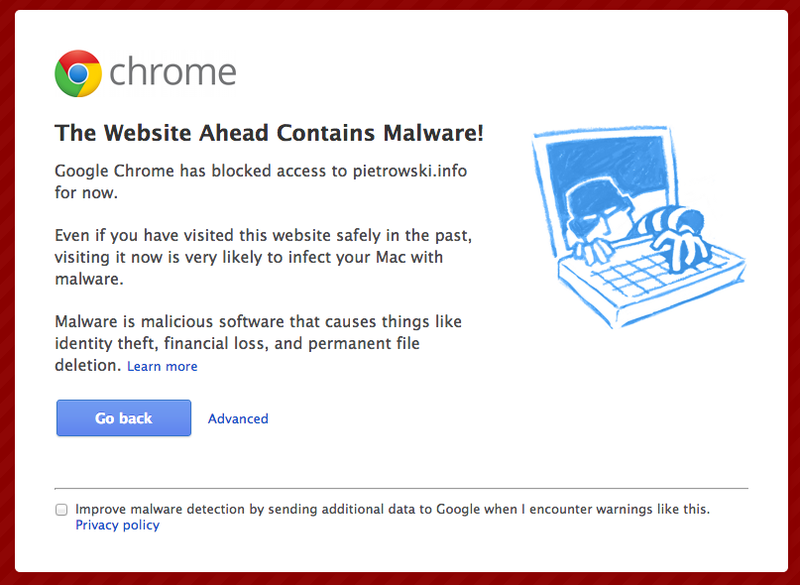 The story went like that: I opened my blog at pietrowski.info, but instead of my blog I had got this (see screenshots). What’s the hell! 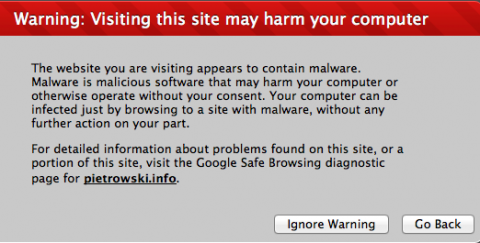 I check different web browsers and I had the same judgment. Fortunately I’m Google Webmaster Tools user, and I remembered that there is diagnostic page, I ran it for pietrowski.info (click link to see actual report). Original result (4.january.2013 below). With my colleague (js-expert), we did backward engineering of the script. Nothing interesting, I can put gists in comments (have to grep gTalk history :)) if you are interested in, anyway the security issue was in one of the plugin, so I made quick decision – remove it (I have no code highlighter right now ;/). What is extremely important here is that, instead reading yet another tabloid (put your favorite name here), read security information of your platform, and perform updates if needed. Of course I had lamer (mean standard) configuration of WordPress.